Yoga is everywhere these days. There are classes at almost every neighborhood gym, YMCA, and library, and people of all ages are taking up the ancient practice. Heck, even babies are practicing Down Dog before their afternoon naps. So it makes sense that yoga is finding its way into the realm of preschool and elementary school-age children as well, and with good reason: It’s a great way to help them burn off some energy–the wing-flapping Bird pose comes to mind here–or relax after a stressful day of school, ballet practice, and homework – savasana, anyone? Teresa Anne Power’s The ABCs of Yoga for Kids is a cute and colorful introduction to the art of bendiness and inner peace for children. Poses are organized alphabetically, with animals and children of all shapes, colors, and sizes demonstrating them. A children’s yoga teacher, Power uses simple language to explain the intricate art form to youngsters; there are no mentions of chakras or Ujjayi breathing here, just plain instructions on how to relax and breathe deeply and have fun in a pose. The illustrations are spare and beautiful, filled with charming details that will make youngsters smile. Some–like the one for Swan pose–almost shimmer on the page, while a cobra practicing cobra pose on a teeny tiny yoga mat is sure to cause a fit of giggles. Children will be able to at least try most of the poses by themselves; parents may need to help on some of the more challenging ones, like Flamingo, Triangle, and Windmill. 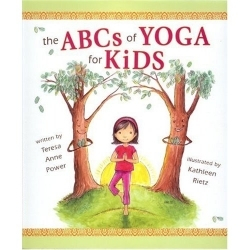 USA Book News named The ABCs of Yoga for Kids a Best Books award winner. Power, who’s been practicing yoga for more than twenty-five years, has written articles about yoga for Yogi Times, the Palisadian Post, and Violet magazine. Sure, the rhymes can be a bit hokey at times: “I arch my back, inhale, and say, ‘Moo.’ Yoga is an activity I love to do.” But children might overlook that while they’ve having fun trying out new ways of moving their bodies. It’s a good way for parents to get their children interested in yoga without having to resort to a New Age-y video or DVD that’s not age-appropriate for youngsters. For ages three and older.